Unilateral posterior crossbite is a problem often seen in orthodontic practice, and properly understanding chewing patterns will lead to the most effective treatment program. Drawing on their research and available literature, Drs. 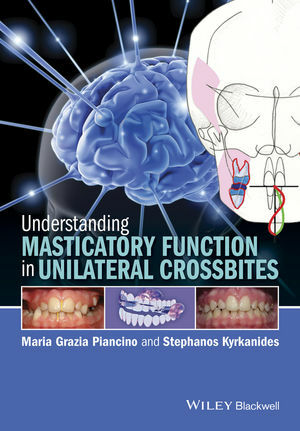 Piancino and Kyrkanides present a fascinating look at chewing cycles and their role in the functional treatment of unilateral posterior crossbite. Maria Grazia Piancino, MD, DDS, PhD, is Aggregate Professor and Researcher in orthodontics at the University of Turin, Turin, Italy. She has more than 25 years’ experience in clinical orthodontics and related research. Dr. Piancino has written for numerous international peer-reviewed publications in the field and lectures on mastication, chewing cycles, and orthodontics at scientific conferences and professional meetings internationally. She is widely regarded as an expert in chewing patterns. Stephanos Kyrkanides, DDS, MS, PhD, is Associate Dean for Research and Faculty Development, and Professor and Chair, Department of Orthodontics and Pediatric Dentistry, Stony Brook University School of Dental Medicine, Stony Brook, New York.